As I sat down to create a card this morning, I had a random burst of inspiration (the best kind, truly) and this came together without much thought. I'm so happy with how it turned out, and this is yet another reason for me to make a zillion more of those baker's twine hearts, right? Right. Jar stamp was purchased from Michaels, ages and ages ago. Baker's twine can be found here—tutorial for crocheting flowers here. 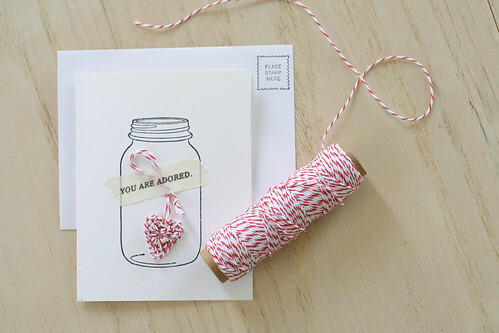 Message masking tape purchased from oh, hello friend. Cute, right? I just hope that the heart survives the journey through the postal system. Stay safe in your little envelope, my friend. Stay safe. LOVE LOVE LOVE! 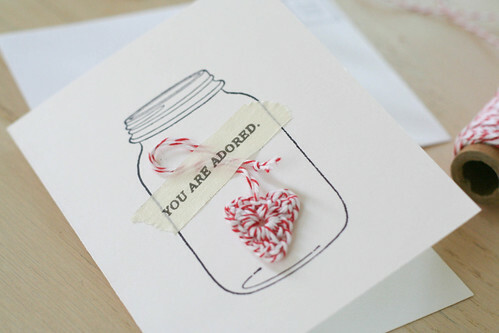 You make snail mail, already a joy, even more wonderful. Love this! So glad you're letting the art of sending gorgeous cards in the mail live on. I am sure the recipient glows when they see it. This is so cute! I've been trying to send more snail mail this year too! 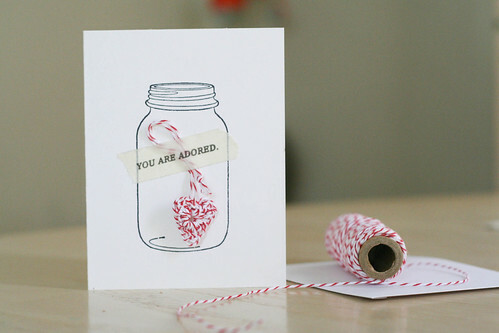 I love that mason jar stamp, I'll have to look for one myself.